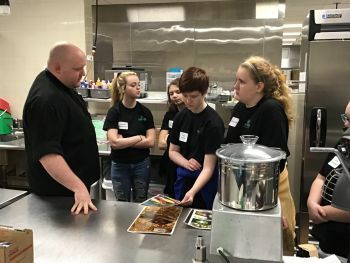 Reid Health Chef Dugan Wetzel shares about food and catering services with Northeastern students. Northeastern Middle School 8th graders this week learned about and experienced the variety of careers available in health care in a pilot program designed to teach employability. The pilot program was the brainchild of Dawn Sonsini, Northeastern Middle School principal and involved more than 100 of the school’s 8th grade students. “The kids loved the hands-on experience in the actual setting,” Sonsini said. The students were divided into career fields based on interest and aptitude tests they’d taken ahead of the experience. The areas included multiple departments and career paths at Reid Health including Engineering, Patient Transport, Lab and Pathology, Accounting and Finance, LEAN, Marketing, Human Resources, Patient Resource Services and Employee Assistance Program, Innovation Center, Information Systems, Communications, Emergency Management, Food & Nutrition Services and of course health care fields such as Nursing and Physical, Occupational, Speech and Respiratory Therapies.